Integrates into your Omnitracs devices – no transponders! Omnitracs Weigh Station Bypass provided by Drivewyze Preclear rewards drivers for their hard-earned safety scores by allowing them to bypass weigh stations and inspection sites and spend more time en-route. With the best drivers seeing bypass rates of up to 98% at Drivewyze-supported sites, Weigh Station Bypass helps fleets save time and money, and increase driver productivity and retention. Save time and money with the largest and fastest growing weigh station bypass program in the U.S.
How Does Weigh Station Bypass Work? 2 Mile Alert - At this point drivers will receive a visual and audio alert, reminding them to prepare for the upcoming weigh station or inspection site. 1 Mile Alert - The driver is again notified of the upcomming weigh station with a visual and audio alert. A driving instruction will follow, shortly. 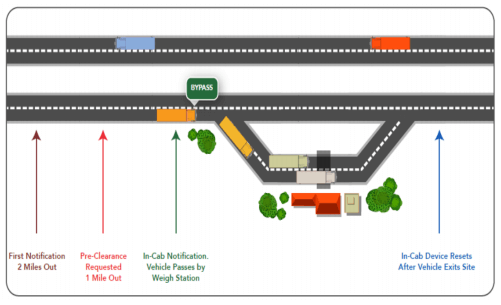 Driving Instruction - Since hitting the 2 mile geofence, truck data has been shared with the weigh station and taking into account carrier safety score as well as some other factors, the driver will receive a bypass or pull-in instruction. Receive Bypass - The driver receives a notification to bypass the weigh station, saving them and the carrier time and money. No lane changes, dangerous lineups on the highway or having to merge back into traffic. Drivers are 3x more likely to join a company that offers free weight station bypass compared to an opportunity that does not. If you are currently an Omnitracs customer, contact us or call us at 1-519-826-4888 for more information on how to easily get started. If you are not yet an Omnitracs customer, visit the Omnitracs XRS page for more information on in cab technology and ELDs or call us at 1-519-826-4888.